Outlays Are Still Going Up, But In Washington, Democrats Call These "Draconian Cuts!" (WASHINGTON D.C.) -- Last week when House Budget Committee Chairman Paul Ryan released his budget plan, the Washington Post tried to encapsulate the document in one single chart - "The Ryan Budget, in One Chart" - which shows the percentage change relative to the CBO baseline, illustrating a steep decline in "Medicaid/Other Health" spending. 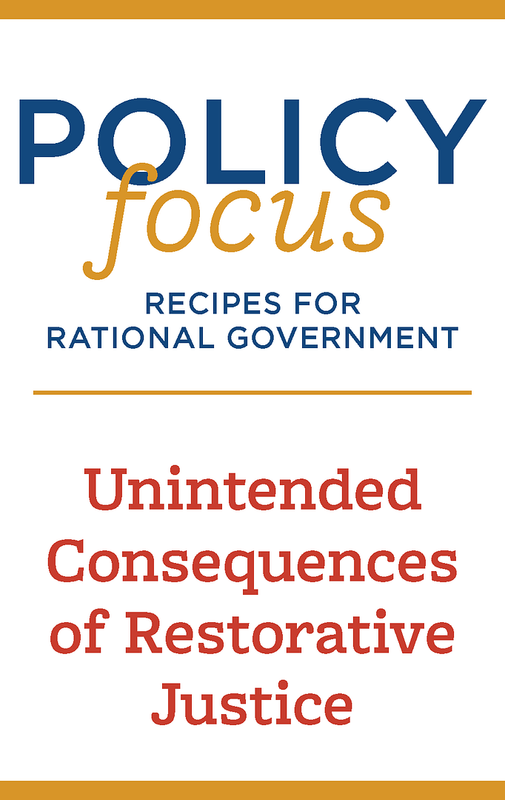 But does Rep. Paul Ryan's budget really impose "draconian cuts?" Go beyond the headlines and things look very different. 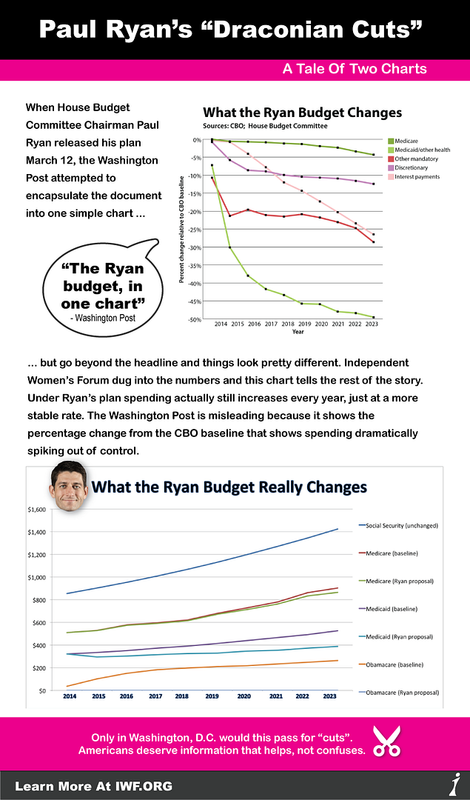 The Independent Women's Forum dug into the numbers to show a different perspective of what the Ryan Budget really looks like. IWF compared outlays in Social Security, Medicare, Medicaid and ObamaCare under current policy projections to those under the Ryan proposal. 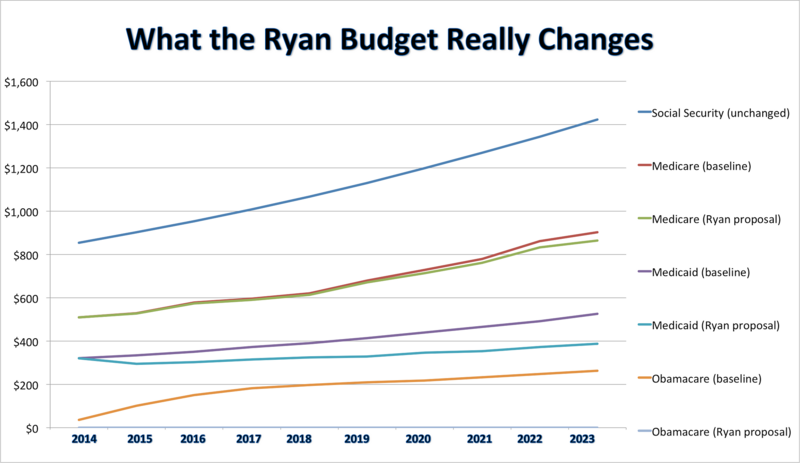 Under the Ryan budget, spending still rises in every category (except ObamaCare, which Ryan would keep flat at zero). Outlays are still going up, but in Washington, Democrats call these "draconian cuts." Hadley Heath, senior policy analyst at the Independent Women's Forum said, "We can see that Ryan's changes, when considered in light of the larger fiscal picture of our entitlements, aren't draconian. They're sensible." She continued, "In the past, Ryan has been criticized by fiscal conservatives for not balancing the budget fast enough. And as we've seen during the recent hysteria over Sequestration, politicos on the Left are ready to demagogue and scare-monger over even the slightest cuts. Ryan's plan won't be the end of the world; it is a good compromise that puts us on a path to fiscal sanity."